Patchmaker are proud to introduce the fourth instalment in our Unicorn Future Bass Series, bringing you great refreshing samples and expertly crafted presets for your favourite soft synthesizers. 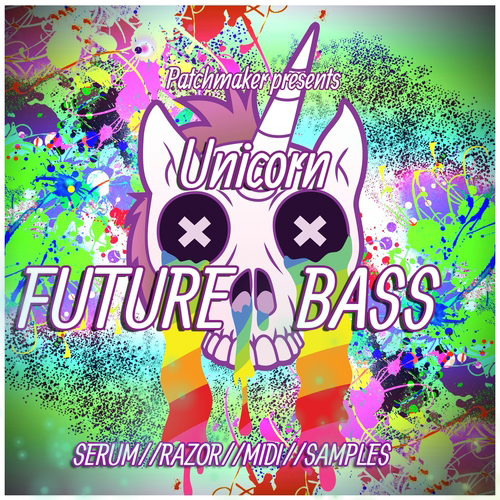 "Unicorn Future Bass | Serum & Razor" gives you a new flavour of future bass genre.Fill up your sonic spectrum with beautiful wobble chords, deep dark basses, gorgeous pads, epic leads, lush MIDI melodies, kicks, claps & snares, hihats,percussions and take your tracks to the next level! These varied and flexible sounds can to fit not only in Future Bass but also in other genres like: house, trap,indie dance, drum & bass, dubstep,hard dance and many more. This set is inspired by magnificent tracks from Marshmello, San Holo, Illenium, Flume and some of the hottest EDM styles on the charts! You will have all the material to create breathtaking and mind blowing tracks.You can use them to add creativity to your musical productions. In detail expect to find over 230 files : 64 NI Razor patches,64 Xfer Serum presets,64 samples (kicks,claps,snares,hihats and percussions) and also 36 MIDIs that were used in the demo. Every preset has all macros (4 macros for Serum and 8 macros for Razor),so you will be able to tweak them at your own preference and and get better results. Check out the demo track and grab your copy of "Unicorn Future Bass | Serum & Razor" today! NOTE: You will need Serum version 1.113 or higher to be able to use these presets. NOTE: You will need “REAKTOR” version 5 or higher or “REAKTOR PLAYER”, and “RAZOR” version 1.5 or higher to be able to use these presets. NOTE: The preview contains sound effects for illustrative purposes only.